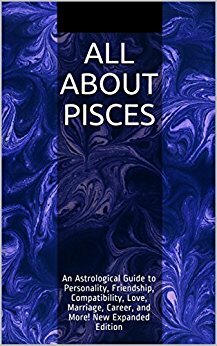 Most Pisceans have an intangible quality that draws others to them, as well as the intuitive ability to pick up on the mental states of others. They also have a tendency to befriend or fall in love with those who need their help in some way. This strong urge to care for and rescue others can have beautiful or ugly results, depending on whether the other person is deserving of this care and focus. Pisceans may be hard to know or confusing to those around them because they can be deceptive about their feelings, in many cases even hiding things from themselves. This is usually done to maintain harmony, prevent conflict, or avoid hurting others, though it may serve the Piscean’s own best interests as well. Because they are so sensitive, Pisceans are easily hurt, and they must work hard to protect themselves. Many Pisceans (men in particular) adopt a tough exterior to hide their vulnerability because they find it easier to endure physical pain than emotional suffering. Unless their own lives are in a disastrous state, Pisceans make good companions for those in crisis, as they are very sensitive to the feelings of others and will minister to those in need with great compassion. They are also diplomatic and tolerant of other people’s quirks and flaws, often showing the greatest kindness and understanding when others are at their worst. Typical Pisceans are open-minded and nonjudgmental, which makes them great confidants. They look for the good in others and give people many chances, a trait that unscrupulous types may take advantage of. Pisceans are romantic and idealistic about their relationships. Although they like to have an anchor (a person who is very solid, sane, and reasonable that they can count on), they are drawn to mystical, day-dreamy, or high-intensity types. Many Pisceans take this even further, choosing partners who are helpless, incompetent, disadvantaged, addicted, or mentally ill, because they need to be needed. When a Piscean is able to rescue a deserving individual, the friendship or romantic relationship can be rewarding for both. However, when others fake conditions or situations to gain attention or resources, Pisceans can waste a lot of time and energy. Pisceans often choose dramatic or chaotic partners and friends. They are somewhat chaotic themselves (which is usually reflected by a cluttered home) and often favor passionate relationships over stable ones. Many Pisceans seem to thrive on strife and wander off when things calm down. This stems from the Pisces need to be needed; if Pisceans feel that their friends or lovers will be fine without them, they tend to redirect their energies toward those who can benefit from their care. Pisceans seek intensity, even though this isn’t good for them. They do far better with trustworthy, practical, earthy types than the insensitive and irresponsible individuals they are often drawn to. However, although the disappointments that come through poor choices may bring them low for a time, Pisceans have remarkable powers of self-regeneration, and when they focus their attentions on those who are worthy, deep and beautiful connections can be forged. The sun sign isn’t the only element that influences personality. Aspects and planetary placements, particularly the moon sign and rising sign (ascendant), are also important. For example, a Pisces with Taurus rising will be more stable and practical, and with Aquarius rising, a Piscean will be less sensitive and secretive, and the desire to care for others will be more likely to manifest as participation in projects, political movements, or other activities focused on helping large groups of people as opposed to focusing on single individuals in need. There are many websites that offer free chart calculation to determine other planetary placements and aspects. Learning these other planetary placements is recommended, as they provide a more comprehensive personality profile.